While all the eyes are on the developing nuclear crisis in Japan, the crisis in Europe is reaching new levels of distress amid escalating debt, unconvincing leadership and hidden losses. Euro zone meeting on Friday failed again to address any of the fundamentals of this crisis but that was to be expected. As in previous meetings European leadership has decided again to simply procrastinate the inevitable and buy some time to brace for impact. They offered the debt-laden Greece a cut in its interest rate and injected more flexibility into the way a bailout fund for the euro can be used. Greece was given a concession on the length of its loan repayments to 7.5 years and agreed to a package with the European Union under which it would raise around 50 billion euros through privatization to cut its debt. The officials rejected though Ireland’s bid for relief as Prime Minister Enda Kenny refused to yield to calls to raise its 12.5 percent company tax rate. The leaders also declined to permit the fund to finance bond buybacks of debt-strapped states. Because of the standoff, Ireland, which like Greece has accepted a bailout from the European Union and the International Monetary Fund, has not been offered a reduction in its interest rate, now about 6 percent. 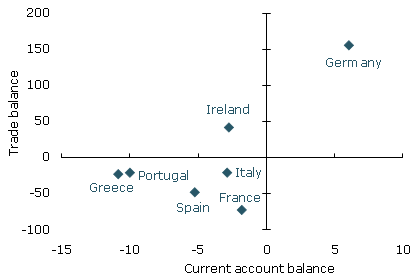 In reply to the euro squabbling the cost of borrowing for Portugal, Ireland and Greece has hit euro-era highs, amid concern in the market that European leaders will fail to take concerted action to dispel fears of sovereign defaults in the eurozone. The long-term market interest rate for Spain whose rating was downgraded to Aa2 on Thursday has come close to setting a record and Italy’s borrowing cost rose above 5 per cent for the first time since November 2008. The moves came as Portugal was forced to pay a sharply higher premium in a debt auction on Wednesday, raising renewed fears that it will be forced to seek an international bail-out. And in a final act of desperation Greece filed for issuing of Diaspora bonds, aimed at Greeks abroad as part of plans by the country to raise funds before it attempts to return to international bond markets. If the Japanese crisis has given some media respite to the battered european finances the risk of default for Greece and Ireland is getting nearer and it is now even considered as an option from the Irish government. Greek 10-year bond yields rose to a record last week and it costs more than ever to insure against a default, even though the nation received a 110 billion euro ($153 billion) bailout from the EU and the International Monetary Fund last year. Two- year yields exceed 10-year levels, suggesting a restructuring may come before the three-year aid program expires. Greek securities plunged last week after Moody’s Investors Service cut the nation’s rating, already at junk, by an additional three levels, saying the probability of default had increased due to “implementation risks” in the budget cuts it is making as a condition of receiving aid. The banking crisis in the country is getting worse, not better. There has been speculation for months in banking circles that the losses at Allied Irish Banks, Ireland's largest retail bank, are far worse than previously thought and could even be as bad as Anglo. There are rumors of a programme involving up to 5,000 redundancies and closures of bank branches up and down the country. We will know the extent of the horror show at the end of March when the latest (and hopefully real) stress tests on four banks – AIB, Bank of Ireland, EBS and Irish Life & Permanent – are published. Portugal has announced a fresh round of spending cuts and public sector reforms in an attempt to reduce its deficit and avoid being forced into taking a bailout. Austria's finance minister had urged Portugal to decide soon whether to seek assistance from the eurozone's crisis-fighting fund. Traders consider Portugal a bailout certainty. Portuguese 10-year bond yields reached 7.70 percent on March 9, the highest since at least 1997, when Bloomberg began collecting the data. Spanish banks together need as much as 15.2 billion euros ($21 billion) to meet minimum capital levels. Spain saw its sovereign debt rating slashed by one notch to Aa2 last week, as Moody’s, the credit rating agency, cited higher than expected recapitalization costs for the country’s savings banks or cajas, and the central government’s inability to enforce ambitious budget deficit targets. Moody's said it believes recapitalization of the savings banks known as cajas will cost at least twice as much, say 40 billion to 50 billion euros. And it says that should the global economic recovery take a detour into slumpville, the costs could double even that estimate, at 110 billion to 120 billion euros. That is about 10% of Spanish gross domestic product, which is a large tab indeed -- though less than a third of what Ireland is on track to pay. But even that tab would be dwarfed by the bill that might come due if Moody's ends up downgrading Spain again – something it warns might become necessary if bank recapitalization costs keep rising and push the country into a European bailout. It appears that no one is even willing to talk of the problems the biggest of the PIIGS is facing. Italy has even been removed by the jovial PIGS acronym to avoid even the slightest association with the peripheral troubled economies. Should the debt crisis reach Italy it would be game over for the euro and certainly this explains the more than amiable attitude of rating agencies toward the third biggest debtor in the world. The country is practically still, economy is stagnant, productivity tumbling and debt rising nonetheless it still get a stable outlook from rating agencies. The divide among European countries is widening and the following report from Bruegel and the American Fed clearly illustrates how the euro zone is tearing itself apart at this very right moment. A recent report from Bruegel, a think-tank called the current wait-and-see approach “a dubious strategy” and said that restructuring was necessary. The main objection to such a policy is the risk of destabilizing the European banking system. But that risk could be contained, the authors argued, if banks’ weaknesses were addressed following new stress tests, which get under way this month and whose results will be published in June. 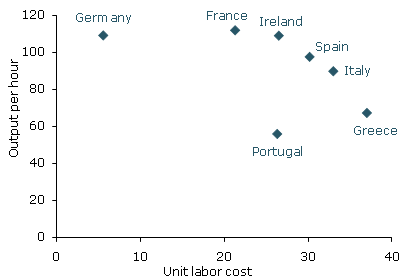 German workers produce a lot for what they cost relative to workers elsewhere in Europe. One reason why this is true is that Germany very effectively reduced wages in the years after reunification through a period of extremely lacklustre growth (encouraged by the Bundesbank). Meanwhile, peripheral wages soared after the introduction of the euro as new capital inflows fueled property booms and government borrowing. The two regions are now very out of step. We have some idea how this might normally be resolved. The currencies of the relatively unproductive countries would fall, tamping down domestic consumption and making exporting industries more competitive. But that can't happen within the euro zone. Another possible solution would involve large-scale migrations from the periphery to Germany (and other economies in similar situations, like the Netherlands), but migration is harder within Europe than within the culturally homogenous American economy. Northern economies might also take steps to reduce labour mobility if a truly large migration began. So what's left? Only a grinding reduction in real wages within the peripheral countries. This is where the ECB's current policy path is so destructive. Germany's tighter labour market has been experiencing some long overdue wage growth, while wages are declining in places like Ireland (and marginal wages are declining faster). The ECB's reaction to this is, apparently, to rein in German wage growth through monetary tightening. The euro zone has asked peripheral nations to run a grueling disinflationary marathon, and the ECB is now running ahead and carrying the finish line ever farther away. Given the situation, the runners may eventually decide to just give up.